The area function is a bit weird. Brace yourself. Say you’ve got any old function, f(t). Imagine that at some t-value, call it s, you draw a fixed vertical line. (Note that because this line is fixed, s is a constant, not a variable.) Check out the figure below. 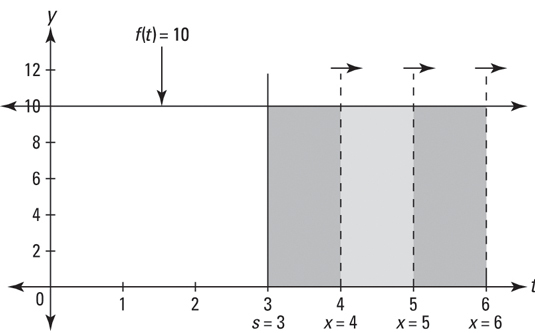 Then, you add a moveable vertical line (the dotted line in the figure) at the t-value x. You start with the dotted line at s (“s” is for starting point), and then drag it to the right. As you drag the line, you sweep out a larger and larger area under the curve between s and x. This area is a function of x, the position of the moving line. The dt is a little increment along the t-axis — actually an infinitesimally small increment. You can see that the area swept out from 3 to 4 is 10 because, in dragging the line from 3 to 4, you sweep out a rectangle with a width of 1 and a height of 10, which has an area of 1 times 10, or 10. See the figure below. Now, imagine that you drag the line across at a rate of one unit per second. You start at x = 3, and you hit 4 at 1 second, 5 at 2 seconds, 6 at 3 seconds, and so on. How much area are you sweeping out per second? Ten square units per second because each second you sweep out another 1-by-10 rectangle. Notice — this is huge — that because the width of each rectangle you sweep out is 1, the area of each rectangle — which is given by height times width — is the same as its height because anything times 1 equals itself. You’ll see why this is huge in a minute. Now here’s the critical thing: Notice that this rate or derivative of 10 is the same as the height of the original function f(t) = 10 because as you go across 1 unit, you sweep out a rectangle that’s 1 by 10, which has an area of 10, the height of the function. that sweeps out the area beginning at s = 2. 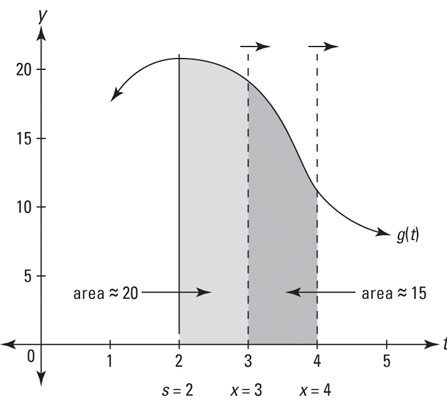 The rate of area being swept out under a curve by an area function at a given x-value is equal to the height of the curve at that x-value. Although it’s a bit loose — in the discussion of the above figure — saying things like “roughly” this and “average” that, don’t worry; when you do the math, it all works out. The important thing to focus on is that the rate of area being swept out under a curve is the same as the height of the curve.